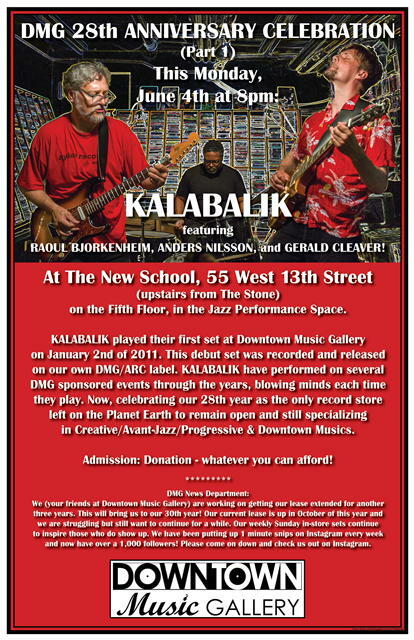 KALABALIK featuring RAOUL BJORKENHEIM, ANDERS NILSSON & GERALD CLEAVER! KALABALIK played their set at Downtown Music Gallery on January 2nd of 2011. Their debut set was recorded and released on our own DMG/ARC label. KALABALIK have performed on several DMG sponsored events through the years, blowing minds each time to play. To help celebrate our 28th year as the only record store left on the Planet Earth to remain open and still specialize in Creative/Avant-Jazz/Progressive & Downtown Musics.